unfortunately it can’t lock focus, it behaves like it would with the LA EA3 on an older generation A7(r,s,II) body. No problem with the LA EA4. The Sigma ART 35mm 1.4 on the other hand works like a charm with the LA EA3, af performance is incredibly fast and without hesitation. The first generation Sigma 50mm 1.4 DG works also like a charm, glad I kept mine around, a lovely lens for portraits, great center sharpness (only one stop behind the ART according to photozone.de) and bokeh characteristics, nails focus every time and you can find amazing deals on Ebay. The Sigma ART 24 105mm f4 auto focuses fast and accurately with the LA EA3. The Sigma 85mm 1.4 DG focuses fast and accurately, however, it does it in micro steps. The Tamron SP 150-600mm f5-6.3 focuses quickly, not sure how well tracks, this is where the fine tuning option for tracking speed comes in. I tested the lenses in the store, basic neon lighting, some areas dimly lit and I didn’t have problems nailing focus with most lenses (stationary subjects), except for the Tamron at 600mm handheld in crop mode, focusing onto the darkest corners was a painful experience. The fastest focusing lens was the Sigma ART 35mm 1.4, a wonderful lens, bokeh characteristics are very nice and it balances well on the A7rii with a battery grip attached. Second in line was the Sigma 50mm 1.4 DG, known for fast af performance since its introduction, however, I couldn’t get my Canon version to nail focus reliably, a known issue with this lens in Canon and Nikon mount. I didn’t have these problems when using it on the LA EA4, although it back focused and needed -5 adjustment, with the LA EA3, it nails focus every time, love using this lens now. A quick reminder, the purpose of this test was to see which lenses work properly in auto focus mode on the A7rii and the LA EA3. Since there is the option to adjust tracking speed, you will have to do some work to get the most out of it, I did it on my Nikon D800E and it was totally worth it, you will get many more keepers if you take the time and test and adjust according to your subjects. There seems to be some confusion about the adapters, particularly when it comes to vintage lenses and the older screw driver Zeiss/Minolta lenses, like the 135mm 1.8 and the 85mm 1.4. All my screw driver lenses work like a charm on the A7rii with the LA EA4. Usually the same front or back focus adjustments need to be dialed in as on previous generation bodies, however, image stabilization works on all of them in auto stabilization mode. certainly gives those old lenses new life! ← Esquire magazine street photography feature! Thanks for sharing, John, good to know! I know from personal experience and contact with Tamron Tech Support that the Tamron 60mm f/2 macro is incompatible with the Sony LA-EA2 and LA-EA4 adapters mounted on the Sony a7 or a6000. It makes a buzzing noise and just doesn’t work. Also, the Tamron 70-200mm f/2.8 Di LD (IF) Macro AF Lens for Sony Alpha & Minolta SLR will not autofocus with the Sony LA-EA2/4 adapters. 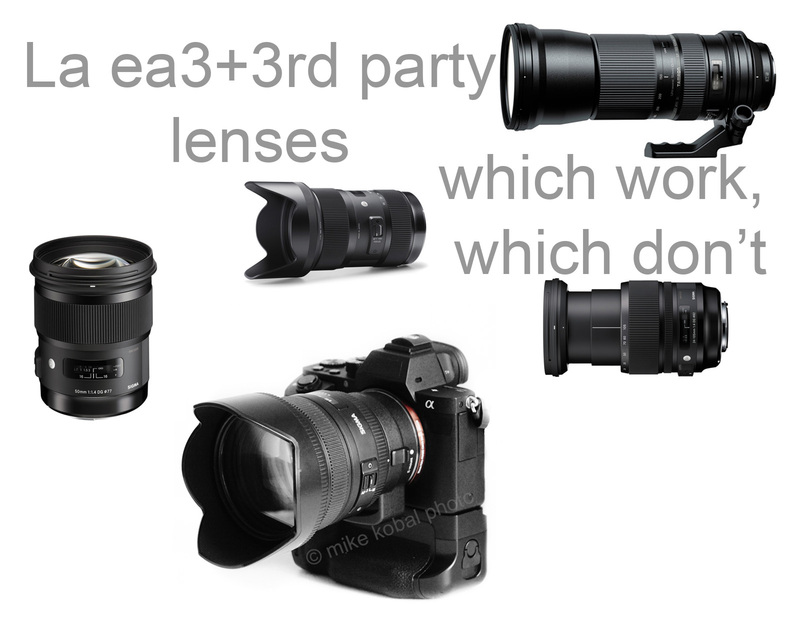 I only have extensive experience with the LA EA3 and it works great, AF will be super fast with the Sigma on A mount, one draw back, eye af – which you can configure on the A7rII if you ever upgrade, does NOT work. Hello Mike, I’m thinking to buy the sigma art 35mm F1.4 for my A7II. I think after the firmware update the AF in third part lens is the same as the A7RII. But i have one concern. Which one i should buy, the one for Canon, i have the fotodiox adapter and works fine with canon lens, or i should buy the Sigma art for A-mount and buy the LA-EA3? What have the best performance? Fast AF and best performance? I haven’t tried it with the adapter, assuming af works, you will get all options except zone focus and face/eye detection and it will be limited to the phase detect area which is quite large. Focus peaking will work with any lens. as far as adapters….I want the be able to use the focus peaking and will I have any AF options? Yes, really helpful… really kind of you. I only had one copy to test, brand new, the 50mm DG and 35mm art for instance, nail focus right away, the art 35mm being the fastest of all, on the 85mm DG I could hear 3 focus steps, as if it focused once, then again and again, usually the last step being the quickest, hope this makes sense, it was still very fast but I don’t know how it compares to the Batis 85mm but we can safely assume the Batis will be faster. Depending on what you shoot it might not matter. Hope this helps. Hi Mike, thx for the really useful info, i also have the new A7RII and i’m really interested in Sigma 85mm HSM. Is it fast in focusing almost like a native lens or it’s slower.. useful for moving portraits in AF-C? (I’m trying to find an alternative at 1,4 to the Batis). Can you explain what you mean with: “focusing in micro steps” ? Means that’s working only in AF-S? Hey Pete, yes, the Sigma 50mm produces great images on A7s, however, AF only works with the La Ea4. I love the ZA135/1.8 (who doesn’t!) waiting for my A7Rii to try it out. Also loved the original Sigma 50/1.4 DG on my D700 – wondering if you have tried that on your A7s? Hi Jon, the a7rii sensor appears to be better suited for legacy lenses then previous generations, so it really depends on what you are shooting, my fav find has to be the 100 200mm f4.5, just love how small and light it is. Are there any other 3rd party lenses (with or without autofocus) you would recommend for adapting to the Sony A7? I already have a Contax G 45mm and Minolta MC Rokkor 58mm f1.2 and just bought the Minolta 100-200mm f4.5. I tried looking for the Tamron 35mm-135mm f3.5-4.5 you mentioned in your post but it’s like trying to find a unicorn. Let me add that the LAE A3 works really well with the Tamron 150-600 5-6.3. Ah that’s cool to know though, yeah Thanks!! Very interesting info, thanks for taking the time to do all that! If you had a chance to test it too, I’d love to know how the Tamron 150-600mm auto focus compares between the LA-EA3 and LA-EA4, if it’s faster / better with either one. Just if you did get to try it with both.